Target audience: Nonprofits, cause organizations, foundations, NGOs, social enterprises, brands. Blackbaud recently published a guide called How to Identify and Empower Those Who Can Engage an Entire Community that includes information about four distinct nonprofit social media personas. 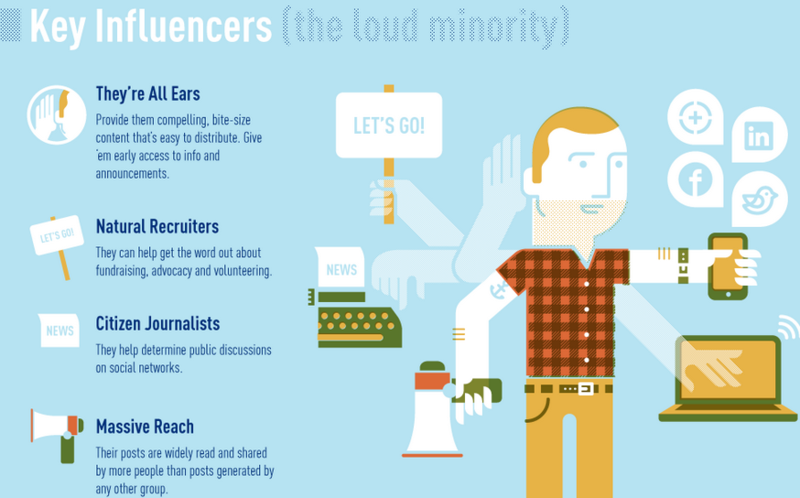 1Key influencers are widely read, and their updates are shared by more people than posts generated by any other group. These folks comprise about 1 percent of your online community. 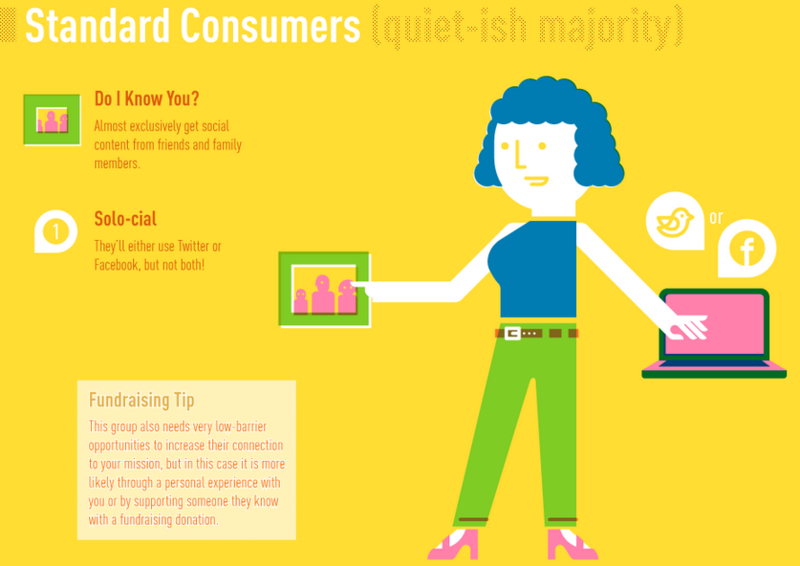 Along with Engagers, they create about 80 percent of the online content in your community. 2Engagers have well-established social networks and are strong influencers of people they know personally. These folks make up about 5 percent of your online community. 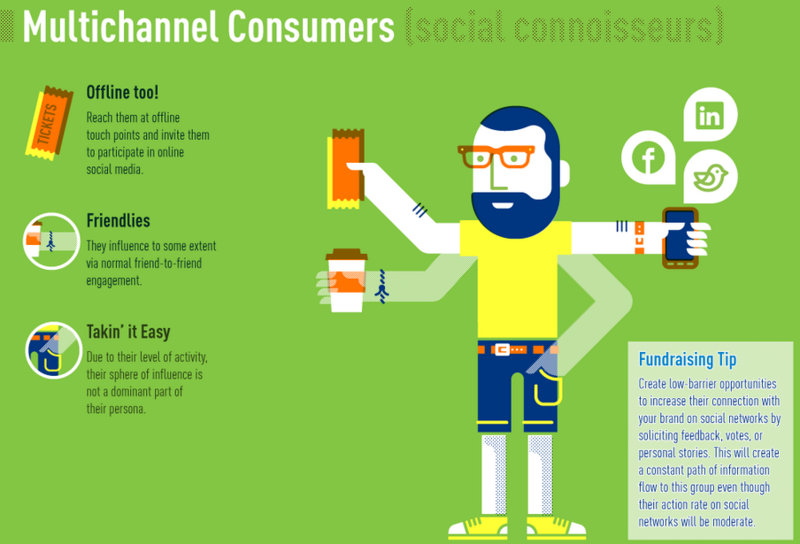 3Multichannel consumers enjoy keeping up with social media content and they occasionally participate. They influence to some extent, but their sphere of influence is not a dominant part of their persona. These folks make up perhaps 45 percent of your online community. 4Standard consumers read and watch updates more than they create new content or make comments, and they are influenced by their more socially active friends and family. These folks make up about half of your online community. It would be a terrible mistake to simply pin these graphics up on your cube without making them come to life. The more you feel in the details of your persona’s lives, the better you create content that truly speaks to them. You can fill in the details about your personas by following these 12 steps. 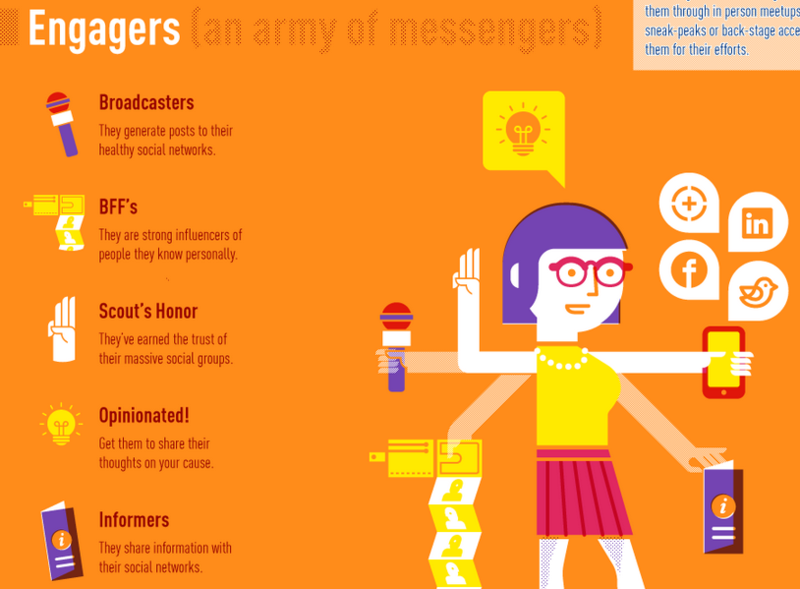 Do you think these personas correctly identify the makeup of your nonprofit’s online community?John Haydon delivers social web strategy solutions for “the quick, the smart, and the slightly manic.” Curious? Then connect up: Contact John by email, see his profile page, visit the John Haydon blog, follow him on Twitter and Google Plus or leave a comment.